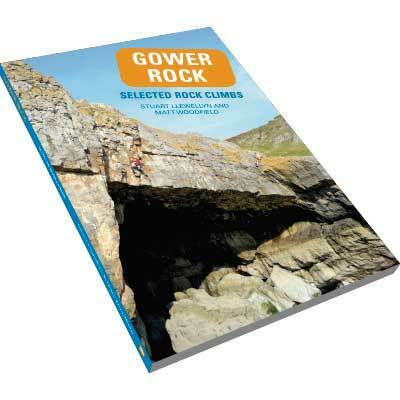 Gower Rock aims to showcase the depth and quality of rock climbing on this wild, beautiful yet somewhat unknown peninsula. The area contains a wide variety of climbing on an enticing array of venues. On some routes you can step straight off golden sands onto classic lines; in other cases you can wend your way across peaceful cliff-top paths before dropping into some pretty demanding terrain just a stone’s throw from ice-cream-scoffing tourists and pastoral picnic spots. In 1956 the Gower peninsula was designated as the UK’s first Area of Natural Outstanding Beauty (AONB). Any visitor to the area will see why: it is packed full of stunning beaches and welcoming villages and provides a breath-taking backdrop to numerous outdoor activities including surfing and paragliding. There are miles of fantastic coastal paths to walk along (a perfect way to explore the many treats of the peninsula) and copious amounts of climbing. You don’t have to abseil in with a book stuffed down your top. Print out this free download (1.2mb) and there’s your perfect pocket-sized guide. Matt is a climbing instructor who works locally; teaching, instructing and taking people on adventures. Soon after moving to Swansea to study at the University in 2002 Matt turned his passion for climbing to a profession and has never looked back. He enjoys nothing more than getting out on rock with people and helping them develop their skills, confidence and experience. To find out more about what he can offer you, go to www.outdoor-matters.co.uk.